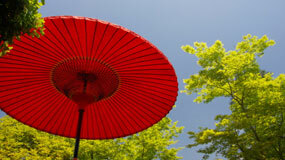 In ancient times, the frames of the umbrellas were made of mulberry bark or bamboo. The Chinese waxed and lacquered their paper parasols because oil repels water. The paper covers are hand-painted with flowers, birds, figures, and landscapes and then coated with oil so that they are not only practical but also pretty and durable. The paper umbrella is something of a traditional Japanese ornamental fashion accessory that was popularly carried in Japanese culture after the Edo period and peaked in popularity during the Meiji and Taisho periods. This type of umbrella was a direct descendant of the silk canopies utilized by Chinese noblemen during the Hejan period. They were typically made of silk and were not made popular until more affordable paper variations were made available to the public. During the height of their use, there were more than one hundred factories manufacturing the accessories in Kanazawa, Japan. A Chinese parasol is an umbrella-like object that has been utilized by the Chinese and other Asian cultures for hundreds of years. 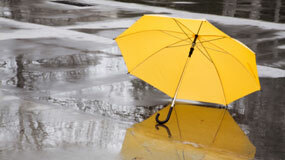 A beach umbrella is a handy piece of equipment to have on the beach for several reasons. The umbrella must be constructed of resilient but lightweight material that is easy to clean and resistant to rain, sun, and wind.